There was a ton of rain that fell all over Las Vegas and the surrounding mountains, lakes and desert yesterday. Then, just in time for this morning's hike to begin, the clouds cleared out leaving a wonderfully refreshing day just waiting to be enjoyed. Eleven hikers showed up for the first hike of the day and we traveled up Lee Canyon Road 10.5 miles to the chain-link fence trailhead. (...We need another name for this spot!...) Nothing but a few wispy clouds marred the blue skies above. We dropped down into Lee Canyon on the equestrian trail behind the fence cubicle. It is an easy diagonal descent. The trail leads up canyon for a little ways before crossing the drainage marked by huge cairns. 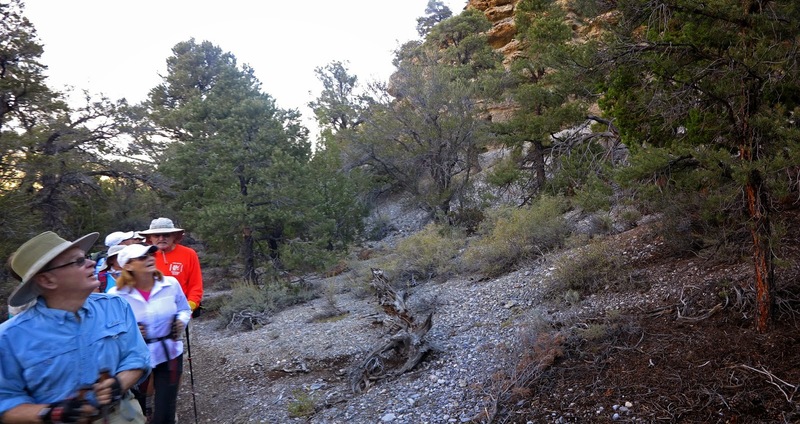 The huge cairns are sort of the mascots of the canyon trail! After crossing the wash this first time, we came to a trail junction where we turned to the right and began following a new well-made trail up canyon. When we found this trail last spring, the trail was only completed about half way up to the narrows. Today, it was a wonderful surprise to find that the trail was finished! It is easy to follow and made wide for horse travel. Kudos to whoever is responsible for this new and beautiful fun trail! We had several hikers who had never seen the narrows so we took a side trip up into the rock walls. At the top end of the narrows, we saw that someone had, again, placed a log in the entrance crack. ... Nope, still would not recommend it! ... After inspecting the area, we scrambled up the side of the hill to return to the trail that leads up and around the narrows. Soon, we were passing through the antique car museum. Last spring, the old Packard was sitting on its roof. It has been returned to it rightful alignment! Rusted cans still hang from the tree nearby. Thanks for restoring our entertainment to whoever managed to turn the car right side up! After the Packard, we dropped into the wash to inspect the other antique car that is half filled with wash debris. Then, from there, we climbed back up to the trail and noted the car that is almost completely buried with the "actual chrome bumper" sticking out. The trail that leads out of the canyon starts there and we turned right to begin climbing. A nice view down canyon can be seen from the trail. Near the top of the canyon, we passed an old galvanized trash can. They don't make them like that any more! It was rather odd to see it there! Does anyone need a futon? 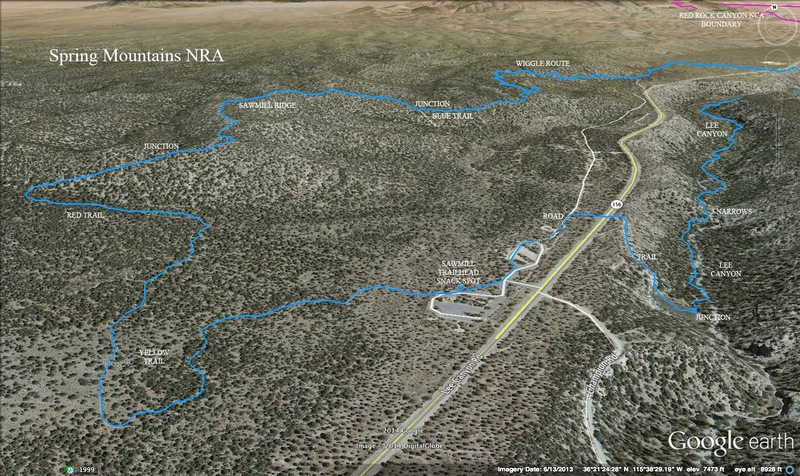 We crossed Lee Canyon Road and bushwacked straight over to Cardamine Road, a dirt road below Sawmill Picnic Area. We turned left on the road and entered the picnic area from the bottom end. At the top end, we sat at two of the tables to take our break near the restrooms. Someone had placed an old futon next to the garbage bin. If you want it, you better hurry! Not sure when the next garbage pick up is but the service around here is exemplary and the futon will not be there afterwards. After a nice break, we started up the Sawmill Trail hiking through the pinion pines. There were pinion pine cones all over the trail and we assumed that the chipmunks or whatever were packing the pine nuts for the winter months. Juniper berries were out in abundance as well. 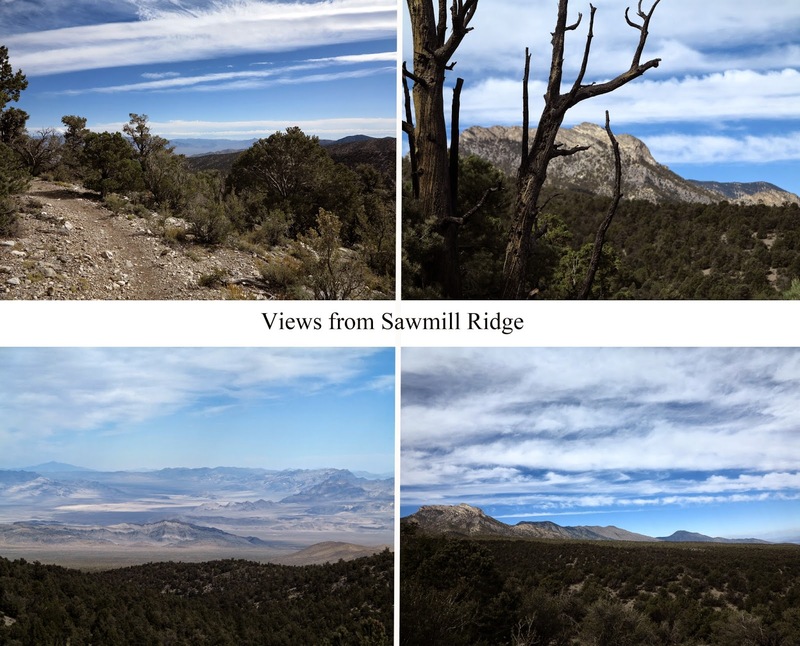 We climbed up to the Sawmill Ridge and enjoyed the vast views of surrounding mountains and desert. High clouds were being blown across the sky above. Once in a while a gust of wind would cool us off, but, weather-wise, we were happy as clams! We began dropping down on the other end of the ridge and noted that someone is trying to route hikers on the yellow trail to the right. This will take you back to the picnic area parking lot. But, we stepped over the trail marker and took the left blue trail junction. This is the beginning of the Sawmill Wiggles Trail. 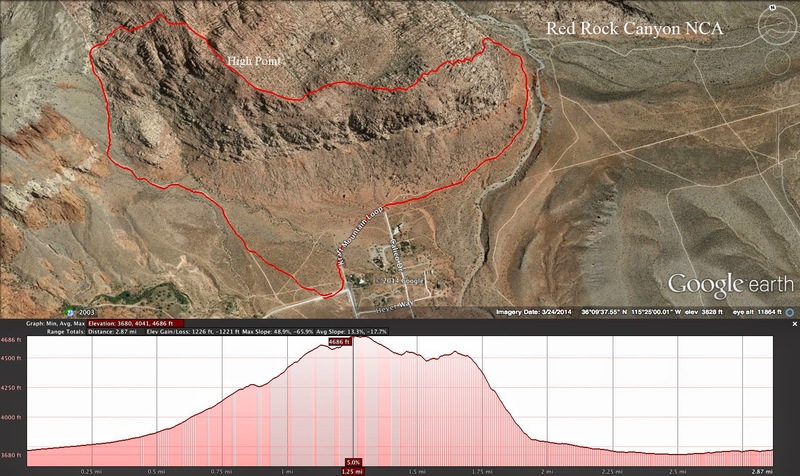 The Sawmill Wiggles Trail is a gentle trail through the woods and high desert that twists around along a descending ridge. Lee Canyon Road comes into view about half way down to the bottom. 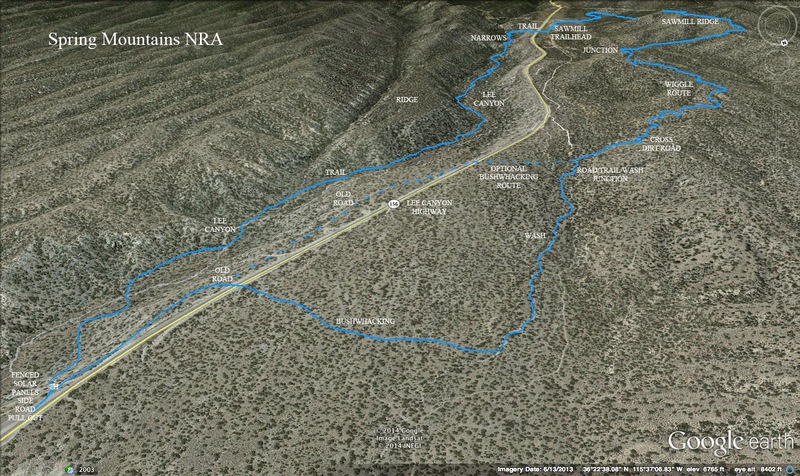 At the bottom of the trail, you cross a steep dirt road and follow the trail down to a wash/road/trail junction. From here, we angled to our one o'clock direction and bushwacked up to Lee Canyon Road to cross the pavement. We connected with the old Lee Canyon dirt road that parallels the pavement, leads through a few campsites and down to the trailhead. The hike was thoroughly enjoyed by all the participants. A great way to log a beautiful 8 miles. 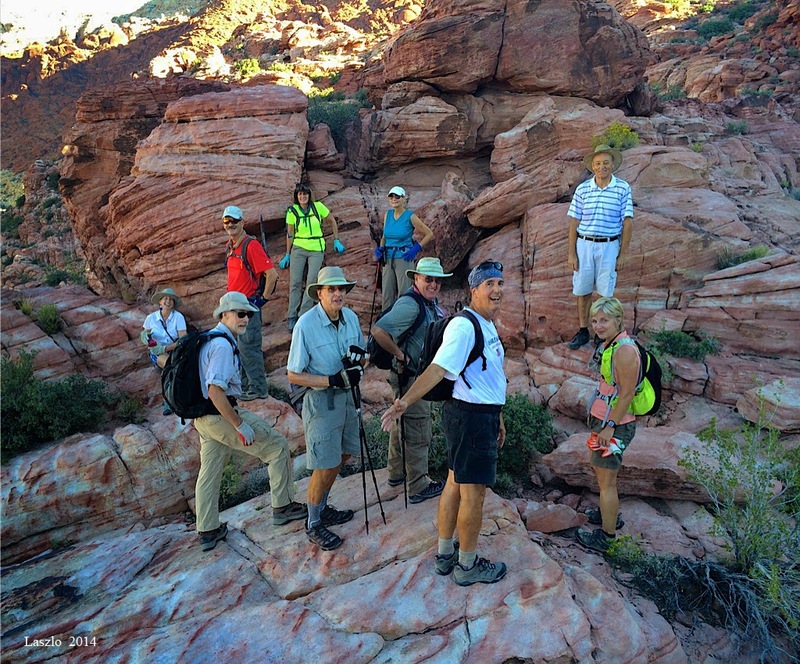 Sixteen scramblers set out from the dirt parking lot in the far reaches of Calico Basin with intent to do a west to east traverse of Krafft Mountain in the Red Rock Canyon National Conservation Area. 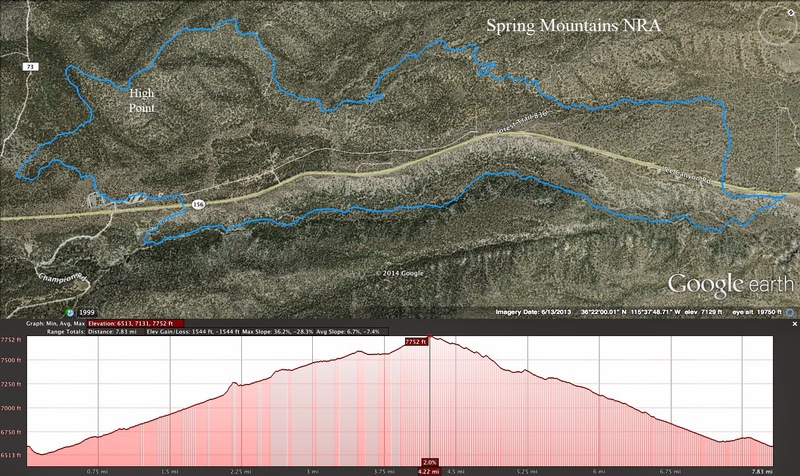 The day would be very warm for late September so the hike was shortened to a four mile loop. We left the cars and headed straight for 5 Stop Hill on the trails. But, today, the hill was a 0 Stop Hill. 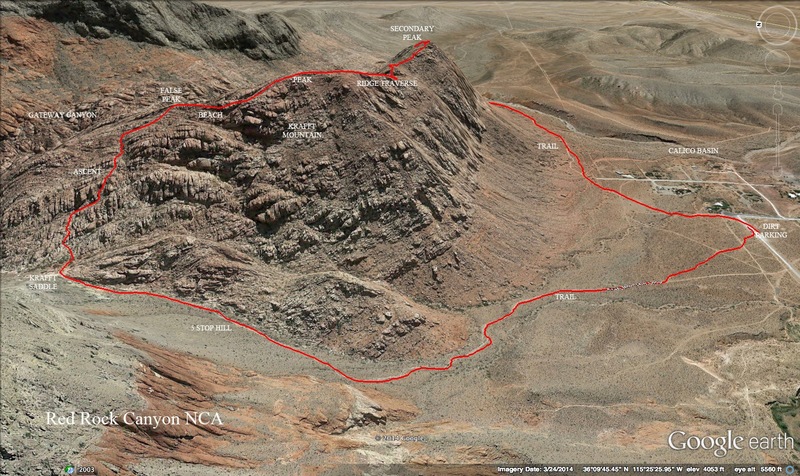 We hiked non-stop up to the Krafft Mountain saddle. 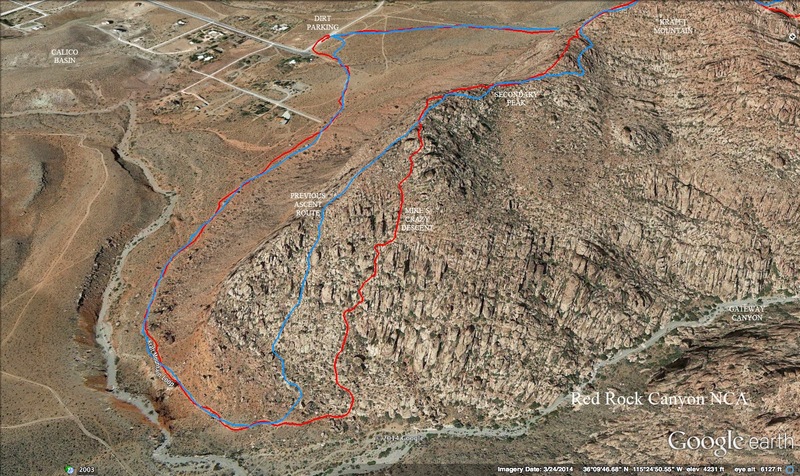 At the saddle, two hikers said they would drop down into Gateway Canyon instead of climbing over the top of Krafft Mountain for their loop-of-the-day. Then there were fourteen! Following no one in particular, we headed straight up Krafft. Our route ended up being a little to the right of the regular ascent route but we had a lot of fun and ended up on the false peak just as always. During the climb, another hiker bailed even though we were very happy to wait for him. It just wasn't his day and he returned the way he came. 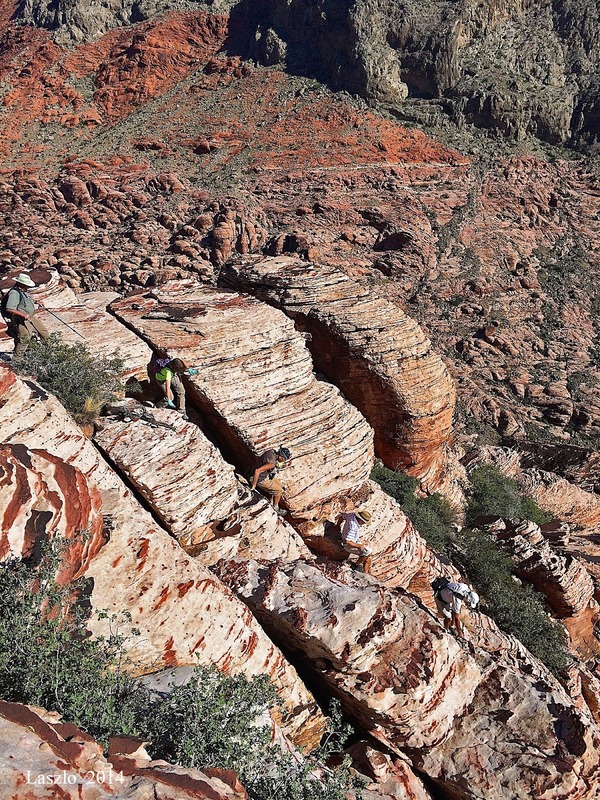 Thirteen hikers continued over the false peak and down to the "beach" area where there is deep red sand. Another scramble up ensued while we solved a couple of Mike's jumbled word puzzles. Yes, we multi-task! We arrived at the peak and took a short break while we wrote our names in the log book and took in the views. It was a beautiful day but there was a haze over the downtown Las Vegas area. From here, we dropped down to a saddle on the ridge as we traversed over to the secondary peak. Who knows if we had taken this route before?! Sometimes hikes are "new" every time .... At any rate, we enjoyed a few interesting obstacles on today's route. There were a couple of tight squeezes and a lot of up, down, arounds. There were even a couple of small leaps! Eventually, we reached the secondary peak. No one was in the mood to climb that peak boulder so we settled on sitting for another break and enjoying a great view of the Calico Hills and Calico Basin. We could see our cars from here ... all accounted for! 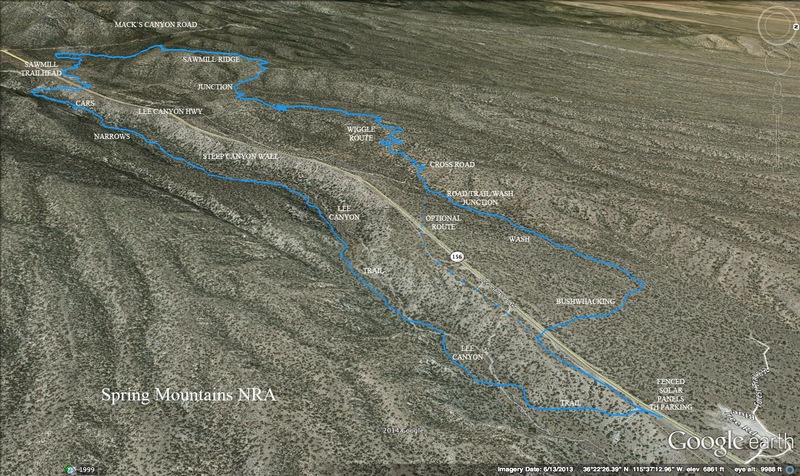 We talked about the recent hikes of Charleston Peak and Bonanza Trail. 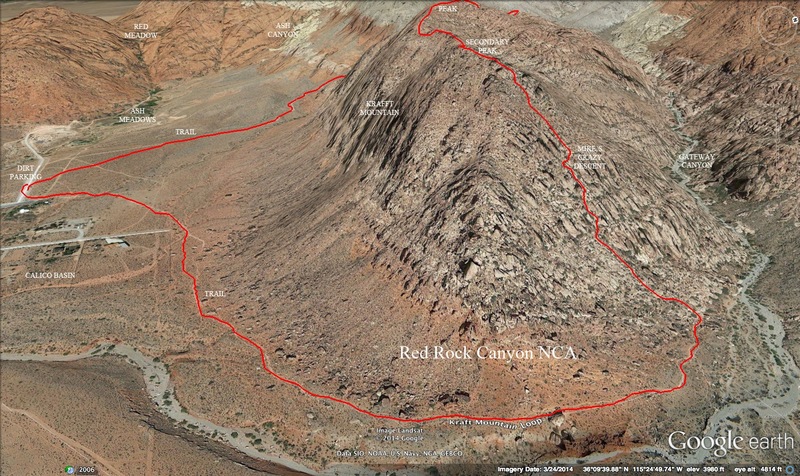 Then we puzzled over the upcoming closure of the large northern area of the Red Rock Canyon Conservation Area. It will be closed for the next 5 years! Not sure what's really going on! Something about re-seeding after the 2013 wildfire but ... did that whole area burn??? No. I guess it's something else. We left the secondary peak and finished traversing the ridge. Passing up the cairns on the right side, we followed Mike straight out to the end of the ridge. Next, we squeezed between two very large boulders and dropped off the end of the earth! Yep, the next 45 minutes involved very steep scrambling straight down the side of Krafft Mountain. We squeezed between rocks to gain traction. We held on to questionable hand holds. We pirouetted around and through the foot holds. Most of all, we were very careful not to dislodge loose rocks! Soon, the larger group broke into two groups. One group edged over to the right and found a slightly more gentle descent in the area of the regular route. The other group adventurously continued following Mike, our fearless coordinator. And, Mike's strategy was to just go straight down. As we followed Mike, we were all looking out for each other. It was quite a rush to accomplish the down climbs being presented! The other group had gathered at the bottom where they enjoyed watching us find our way. At the bottom, we found ourselves still in one piece and we hiked the trail that circles Krafft Mountain and leads back to the cars. Great fun! !